Dairy cows on K&K Dairy Farm in Westphalia, Michigan. Michigan is one of the nation’s top milk-producing states. In 2016, Michigan’s dairy cows produced 10.9 billion pounds of milk, worth $1.64 billion, according to the Department of Agriculture and Rural Development. Nationally, Michigan ranks 5th in production, with California in 1st place. Four other Great Lakes States — Wisconsin, New York, Pennsylvania and Minnesota — are also in the top 10. But Michigan lacks the facilities to process all of that milk. Raw milk is sent to processing plants in other states. “Currently about a third of all of our milk leaves the state,” said Terry Philibeck, the deputy director of the Food and Dairy Division at the Department of Agriculture and Rural Development. That’s a problem for dairy farmers. “That affects milk prices negatively because then you have transportation costs to move that milk to markets beyond our state lines,” said Ken Nobis, president of the Michigan Milk Producers Association, headquartered in Novi. Processing plants take raw milk and pasteurize it. Depending on the type of plant, the milk is either left as a fluid and sold for consumers to drink, or it is turned into a dairy product, such as cheese, butter, yogurt and milk powders. Philibeck said milk transported out of state is usually sold at a distressed price, and out-of-state processing results in higher transportation costs. Keilen and her husband, Matthew, operate K&K Dairy Farms, which has been in his family for four generations. 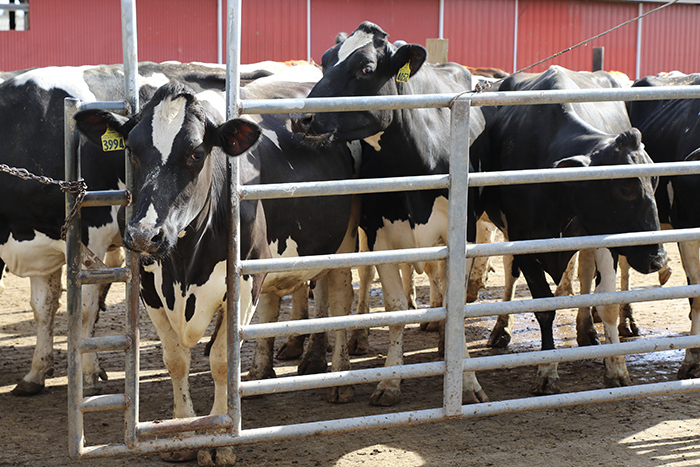 Michigan has 99 licensed dairy processing plants, according to the state. However, approximately two thirds are small artisan processors with very limited production capacity. There are roughly 30 large processing plants in the state. Michigan’s shortage of processing capacity is due to the rapid expansion in milk production, which has doubled since 2000, Philibeck said. The industry was growing at a rapid pace and going through segments of economic prosperity at the same time, said Ernie Birchmeier, a livestock and dairy specialist for the Michigan Farm Bureau. Increases in farm efficiency coupled with an ideal climate for cows led to rapid growth in the productivity of the state’s dairy industry. “Michigan dairy farmers are some of the best in the world at managing farms and cows,” Birchmeier said. Michigan’s cows rank 2nd in the country for production of milk per cow, according to the Agriculture and Rural Development. Processing capacity is slowly catching up to the increase in supply. Foremost Farms, a farmer-owned dairy cooperative based in Baraboo, Wisconsin, is opening a processing facility in Greenville that’s expected to process up to 6 million pounds of milk a day. Glanbia Nutritionals, an Ireland-based company, has partnered with Dairy Farmers of America and Select Milk Producers Inc. to build a cheese plant in St. Johns. An adjacent plant, built by Proliant Dairy Ingredients, an Iowa-based company, will produce whey powders, according to the Michigan Farm Bureau. The plant is expected to be finished by late 2020. Keilen said she expects the plant in St. Johns to significantly reduce her trucking costs. The dairy market has taken a hit in recent years, Nobis said. Globally, there’s too much milk on the market, which is driving prices down everywhere. The federal administration’s tariffs on steel and aluminum also have a negative impact on dairy and other agricultural products. And Nobis said that if the dairy market rebounds and prices increase, more expansion in Michigan is possible, but there’s just no way to know what the dairy market will be like in the future.